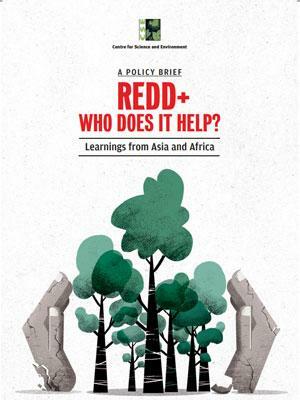 Policy Brief: REDD+ Who does it help? Deforestation and forest degradation have been globally acknowledged to contribute significantly to greenhouse gas emissions and climate change. The most prominent global mechanism to tackle deforestation and forest degradation is called Reducing Emissions from Deforestation and Forest Degradation, or REDD+. Since its formalisation in 2007 at the United Nations Conference of Parties (CoP) on climate change held in Bali, Indonesia, more than 300 REDD+ initiatives have taken off across the world, with mixed results. However, after a decade, there is no convincing evidence to establish the contribution of REDD+ in halting or reversing global deforestation trends. In fact, figures on tree cover losses released at the 2018 Tropical Forest Forum in Oslo, Norway show that 2016 and 2017 have been the worst years for tropical forests since 2001. In these two years, tree cover loss has amounted to an area of forest equivalent to the size of Vietnam.1 The results have got the forest fraternity scratching their heads to figure out where their efforts have gone wrong.